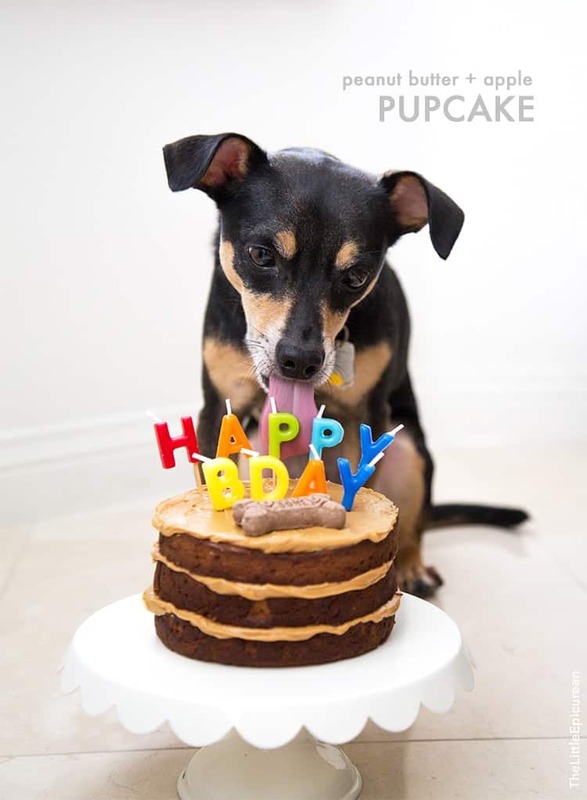 Peanut Butter Apple Pupcake is perfect treat for celebrating your dog’s birthday. It’s made with applesauce cake and frosted with peanut butter. Top it with your pup’s favorite biscuit treat! Ten years (heck, even 5 years) ago, none of my friends or family would ever believe that I’d have a dog. It’s not that I didn’t like dogs. I love animals. I just never had the time or wanted to deal with the responsibilities (and mess) of caring for a pup. Fast forward to present time and I have two dogs. And honestly, I can’t imagine a life without Charlie or Taylor. Before meeting Charlie, I had spent a great deal of time visiting local shelters and scanning pet adoption websites. I had met other pups, thought they were extremely cute, I never felt any connection with them. And then I met Charlie. I immediately knew he was meant to be part of my family. I found Charlie through Cuddly Canines, a non-profit rescue organization serving LA/OC counties. Cuddly Canines was hosting an adoption fair at a nearby Petsmart. There was at least 15 pups of all ages there. They all were super energetic, jumped, barked and played with one another…expect little Charlie (then named Hobbs). He was the smallest dog there and he was tucked in the corner sleeping soundly. I was told that Charlie was a solo orphan that was dropped off at a local shelter. Luckily the foster family that cared for him had a new beagle mom that took Charlie in. We’re not really sure the exact date Charlie was born, but it was sometime in early July. As a result, we’ve always celebrated the first weekend of July. This past Saturday (4th of July!) 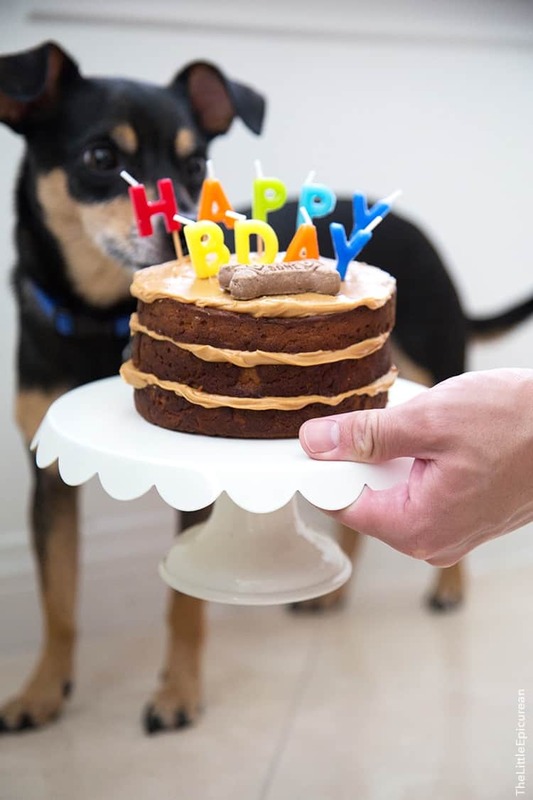 we threw a paw-ty for Charlie’s 4th birthday and served him this peanut butter apple pupcake! Charlie brings so much happiness and joy to my family. He is super sweet and polite. Unless you hit the doorbell or knock on the front door, then a completely different dog emerges. Whenever I’m reading a sad book or watching drama on tv, as soon as I start sniffling or tearing up, Charlie immediately tucks himself under my arm and begins licking my face. He’s so caring. Even when it comes to sharing his toys/crate/treats with Taylor, he’s always willing to oblige. Charlie is also the world’s pickiest eater. Partly because my mom always cooks him special no-salt chicken breast with freshly steamed rice whenever he sleeps over. That and the fact that Charlie knows if he holds out long enough, my dad and brother will cave in and give him treats galore. Despite his picky palate, one thing he can never refuse is peanut butter. Hence, this peanut butter apple pupcake! Happiest of birthdays my dear Charlie! Here’s to many, many, many more! Preheat oven to 350 degrees F. Line 3-inch round cake pan (5-inch tall) with parchment paper. Lightly grease and set aside. In a large bowl whisk together flour and baking powder. Add whisked eggs, oil and apple sauce. Stir to combine. Once there are no longer any streaks of dry flour, add peanut butter. Stir to mix in. Follow with shredded apples and honey. Fold to combine. Transfer batter to prepared cake pan. Bake for 35-40 minutes until toothpick inserted in center of cake comes out clean. Allow to cool in pan for 3-5 minutes before unmolding. Let cool to room temperature on wire rack. If desired, slice cool cake into four layers. Stack layers together using a thin layer of peanut butter. Top with dog biscuit. Serve immediately. 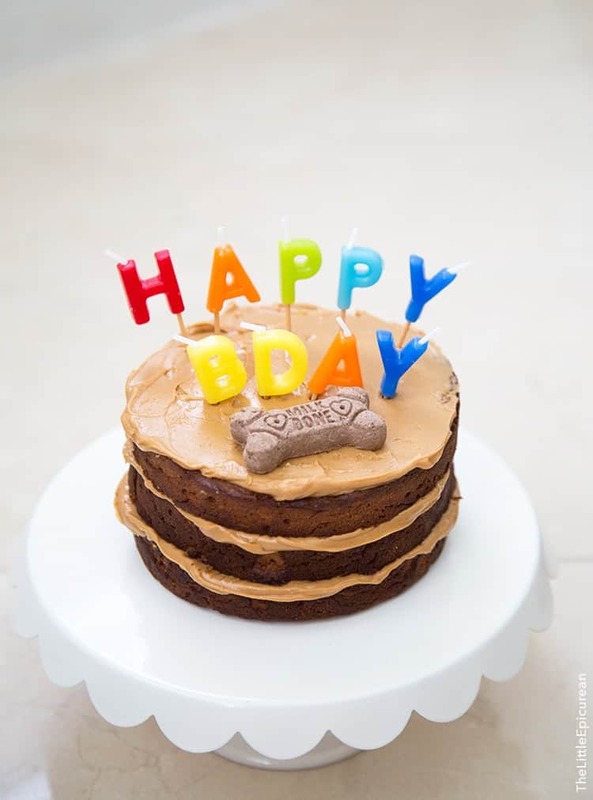 This is a very large and rich cake for small dogs. If possible, use unsweetened and unsalted smooth peanut butter. I served Charlie and Taylor a very small slice each. It's quite decadent. Humans can obviously eat this cake as well...it just doesn't have the sweetness humans associate with cake and treats. 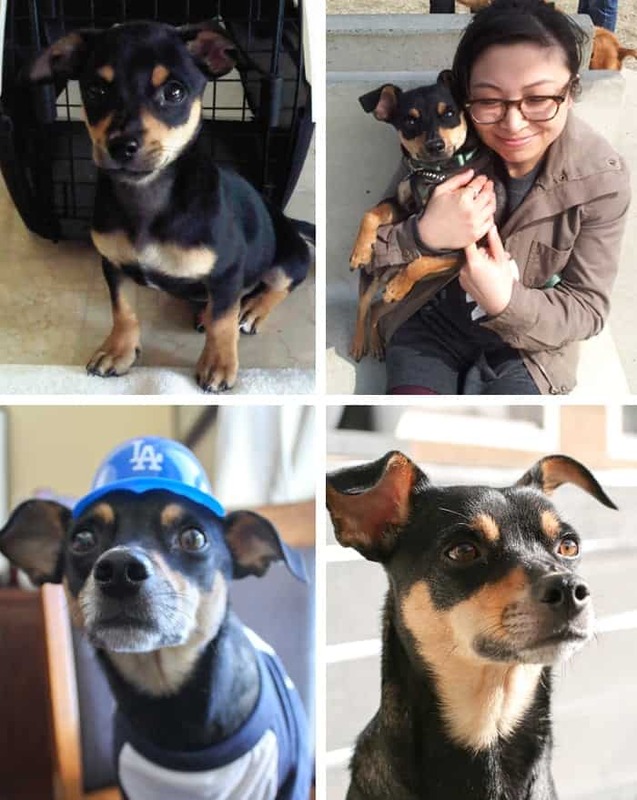 Charlie over the years! The top photo on the left hand corner was taken the first day we took Charlie home in 2011. He was this tiny little puppy, about 10 weeks old and a just a tad bit under 4 pounds. Charlie is adorable and clearly one LUCKY dog! I think lots of dogs just love peanut butter so I’m sure they savored each piece! Happy Birthday, Charlie! Dogs are so special and your little guy is so cute and very lucky to have a Mom like you. My girl, Daisy, will celebrate her 3rd birthday on July 27th. I just may have to make her a peanut butter apple pupcake since she adores peanut butter. Happy birthday Charlie! What a gorgeous member of your family he is! Since moving out I miss our family dog so much! I think I visit my parents more because then I can visit her… I can’t wait for Miss Molly’s birthday so that she can enjoy a delicious pupcake too! Oh! I’m so excited to try this for my Dodger Fan’s birthday this week! My Auggie Doggie is turning 4. I know this cake with leave him drooling in his dreams for next year! 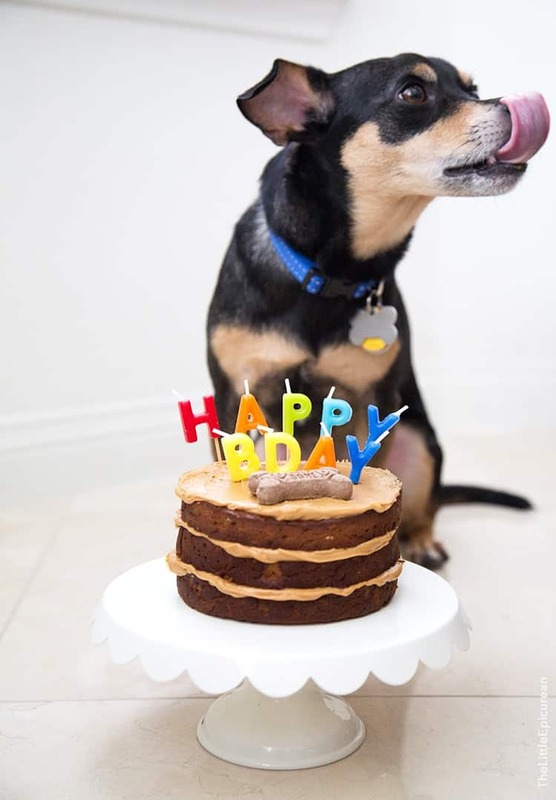 Wishing your pup a very happy birthday! I hope he loves the cake! Do you know Charlie’s breed at all? Will this make enough for an 8” or 9” pan? Cooktime? Yes, you can bake this in an 8 or 9-in pan. You’ll have to reduce the baking time by about 10 minutes. This is such a great idea! As I was reading through, I noticed you say to use unsweetened peanut butter. My puppies vet told us to never feed our pups unsweetened peanut butter because it’s very harmful to them and can be as deadly as chocolate. He said that regular peanut butter is a way better option! I was told the opposite by my vet. Regular peanut butter has too much sugar and salt for dogs.